How different will Disney's remake of The Lion King be to the original? The new trailer for The Lion King stresses the sense of continuity between the 1994 animated classic and Jon Favreau's photorealistic remake. It features loving reproductions of some of the most beloved scenes from the original, including many shots from that iconic "Circle of Life" opening. Disney has proven that their remakes can be tremendous box office successes, with hits including Beauty and the Beast and The Jungle Book. The key is to honor the original while also making a film that feels distinctive and unique in its own right. In the case of The Lion King, Elton John has already confirmed that one of the classic tunes - "Be Prepared" - will be dropped. Meanwhile, Elton John and Tim Rice have been working with Beyonce on a brand new song for the end-credits scene. The first teaser trailer draws strongly on a sense of continuity between the animated version and the modern remake. The bulk of the scenes are lifted straight from the film's breathtaking opening sequence, in which Rafiki introduces Mufasa and Sarabi's newborn cub to the animal kingdom, and they're remarkably faithful reproductions of the original. And yet, even in a trailer that stresses the similarities between the two versions, there are some very visible changes. Let's take a look at them. The animation in the original Lion King is clean and simple, with the animators going to great effort not to overcomplicate the images. In the opening scene of "The Circle of Life," for example, there's a sunrise over the African plains - with just one of the iconic African Baobab trees in view. That kind of approach works for an animated movie, but it would seem out of place in Favreau's photoreal version. He has to create an environment that's a little more believable, and as a result his sunrise scene is packed with Baobab trees. It's a much more true-to-life version of the African Savannaland. The trickiest scene of all is undoubtedly the one where the animals gather around Pride Rock to celebrate Simba's birth. This would have been a massively challenging scene for the animators, with so many different animals to animate. As a result, the 1994 classic tries to keep things as simple as possible. The animals don't intermix or mingle at all; you get groups of antelopes, giraffes, and elephants. 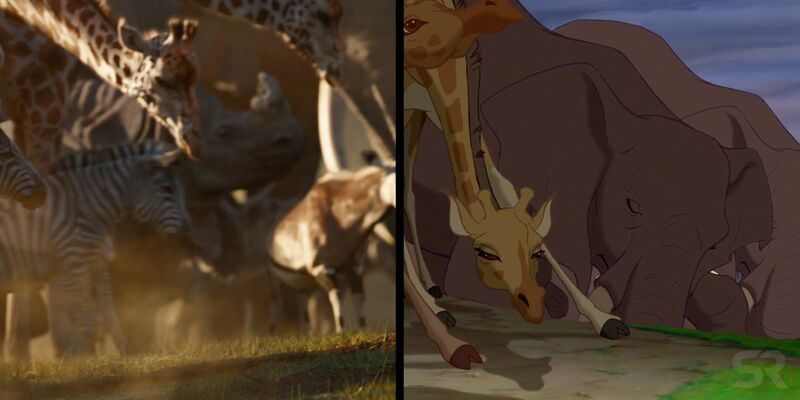 Look closely, and you'll even notice a strong element of duplication, with the animators essentially copy-and-pasting the same elephant or giraffe, and colorists making them look different by using a different tone or hue. These approaches are not feasible in a photoreal Lion King, and as a result the modern rendering of the scene is very different. The animals are mixed, with rhinos and zebras, giraffes and elephants standing side-by-side. What's more, in the images of the trailer, there's no sense of duplication at all; each animal is modeled individually, unique from the rest. Let's focus in on one of the specific characters: Rafiki, who essentially serves as the priest of the pride. He's featured at length in the trailer, climbing up Pride Rock and anointing the young Simba with a mysterious red substance. There have been a substantial number of changes to Rafiki - some cosmetic, some not. The most obvious change is the fact that Favreau's version doesn't appear to need a walking stick. That makes sense; in the real world, mandrills don't use walking sticks, so it wouldn't work for a "live-action" rendition. It may mean some key scenes in The Lion King play out a little differently, although it's possible Rafiki will just pick up a stick from the ground at certain moments. Some of the other changes are more difficult to explain, though. 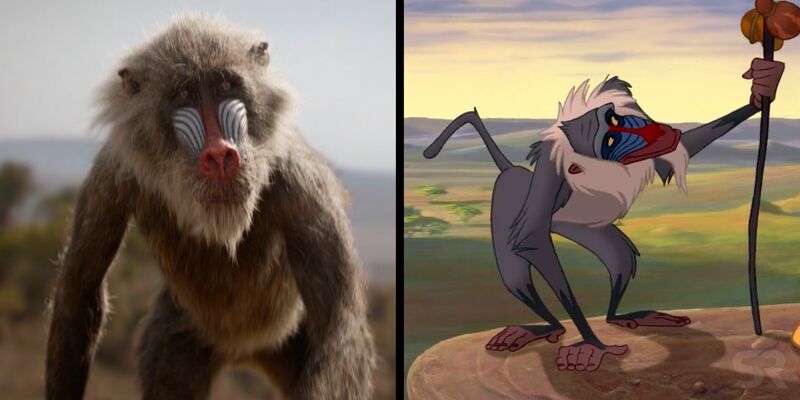 The Rafiki of The Lion King remake is right-handed, rather than left. Presumably that just happened to make more sense for the camera angles the production crew favored. More interestingly, in the animated classic Rafiki anoints Simba with a red liquid that's come from a fruit. In the remake, he uses a red powder that he gets from breaking what appears to be a root. It's as yet unclear why Favreau has chosen to switch this particular detail up; perhaps he simply couldn't identify a real-world African fruit that would look like that.